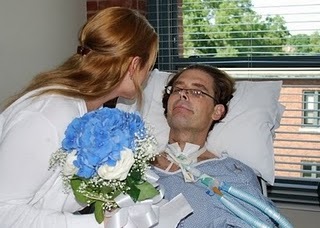 Paralyzed Cop to Get Ultimate Wedding? Law enforcement officers hold dangerous jobs, and the injuries incurred from violence naturally make us indignant against the perpetrators, while the workplace accidents often seem meaningless and inexplicable. They are, after all, only doing their duty to serve and protect the community. Despite the all too often tragic consequences of police work, there is sometimes a happy ending. The story of Chicagoans Mary and Densey Cole, which surfaced in a recent issue of the Chicago Tribune, is an example of the good that can potentially result from such tragedy. It also happens to demonstrate the many opportunities for wedding officiants to make a difference in people’s lives. The Coles had been planning their dream wedding when Densey was involved in a three-car accident while responding to a burglary call. He was paralyzed. To top things off, while he was still pinned inside his car, a thief stole his gun and threatened to kill him. Densey, who received a severe spinal cord injury, spent months in Denver’s Craig Hospital, known as one of the foremost facilities for injuries to the nervous system. Eventually, they returned to Chicago, where Densey continued to recover. Finally, after he awoke from a four-week coma, the couple held a tiny wedding ceremony inside Densey’s hospital room, a far cry from the lavish ceremony and reception they had planned. Densey even notes that just ten minutes after they said their wedding vows, he became too ill to go on. Such is the course life all too often takes, and cheerless, sometimes angry questions accompany our frustration. But sometimes, what begins as a curse ends in divine justice, or so it seems. While Mary Cole was shopping at Crate & Barrell—a major U.S. furniture chain store—she found out that the store was sponsoring an “Ultimate Wedding” contest worth $100,000, so she entered herself and her husband in the contest, which required a one hundred-word essay about how they met and fell in love. Because the winner is determined by popular vote, the Coles have been leading by at least double the amount of the next highest vote. So far, if the Coles keep up their pace, their humble little hospital wedding might turn out more lavish than they had ever expected. Some of the fantastic wedding and honeymoon getaway ideas they have been mulling over include a wedding on the beach in Hawai’i or Playa Del Carmen, Mexico. But not everyone is so lucky. Nevertheless, in anticipation of finally getting their dream wedding, Densey has made gains through physical therapy and can now sit upright on the edge of his bed. With copkillings and violent tragedies dominating the recent news—not least of all here in the Seattle area, where, despite a declining homicide rate, several police officers have been murdered in the past few months—the story of the Coles is a refreshing glimpse at triumph over adversity and our fellow human’s capacity for sympathy. In addition, it highlights the many unique circumstances in which online ordained ministers can demonstrate their commitment to serving their community and proving that personal passion, and not necessarily traditional minister training, can make a difference. One way of making your work as a pastor even more fulfilling is to seek out the least fortunate members of the community and hold a sermon, send a prayer, or take the opportunity to officiate a wedding for those whose dreams have been postponed. While the Coles might just get their wish, there are many other young brides and grooms whose ceremonies are even more dismal than a hospital wedding. While ministering in this way would be but a small contribution, it would be far more personal and meaningful than hiring a stranger as an officiant or settling for a mere trip to the county clerk’s office; it would also allow friends and family to play a prominent role in the most important day of a couple’s life, making it a truly special occasion. The face of marriage is changing rapidly, and this includes an increasing number of unconventional, modern wedding ceremonies. We more than welcome our ministers to share their stories about some of the more unusual weddings they have solemnized, some of the exigent circumstances they have had to deal with, and how they managed. It certainly does not have to describe a lavish retreat to the French Riviera or a trendy ceremony inside an Apple store—even the most mundane wedding can be the most inspiring. How has your experience affected you or the couple you married for the better?